赵芳坤, 张劲松, 施蓓, 宋雨凌, 许军. 糖尿病视网膜病变基因相关研究热点的文献计量学分析[J]. 中国医科大学学报, 2018, 47(12): 1067-1071, 1076. ZHAO Fangkun, ZHANG Jinsong, SHI Bei, SONG Yuling, XU Jun. 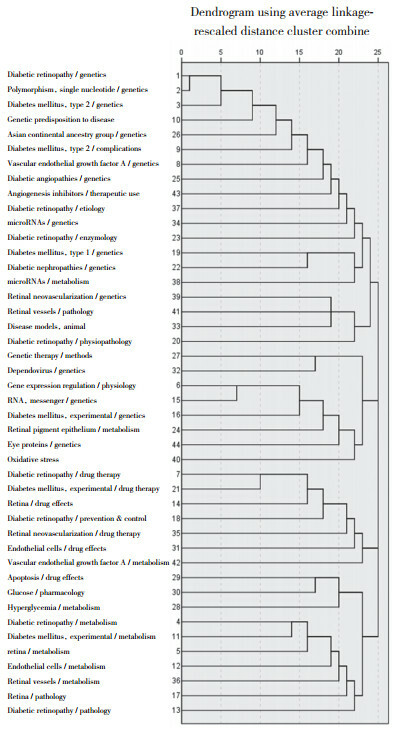 Theme Trends and Knowledge Structure of Diabetic Retinopathy-Related Genes: Quantitative and Co-Word Analysis[J]. 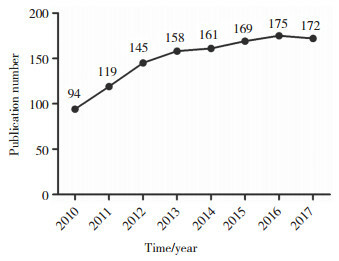 Journal of China Medical University, 2018, 47(12): 1067-1071, 1076. Abstract: Objective To survey the distribution pattern and knowledge structure of diabetic retinopathy (DR) -related genes based on a literature search in the PubMed database. Methods Scientific papers published between January 1, 2010 and December 31, 2017 were retrieved. The extracted MeSH terms were analyzed quantitatively using bibliographic item co-occurrence mining system (BICOMS), and MeSH terms used frequently were identified. Hierarchical cluster analysis was conducted with SPSS 19.0 according to the MeSH term-source article matrix. A high-frequency MeSH terms co-occurrence matrix was constructed to support a strategic diagram. Results According to the search strategy, 1 193 papers were included. Among all those extracted, 44 high-frequency MeSH terms were identified, and hotspots were clustered into 5 categories. In the strategic diagram, cluster 1 and 5 were well developed. In contrast, cluster 2 and 4 were not well established, indicating the possibility for further research in the field. Conclusion Studies on DR genes are relatively diverse, and the 5 research categories derived from this study may reflect publication trends for DR-related genes to some extent. Quantitative bibliometric research for a 7-year period could aid in depicting the overall command of the latest topics and provide some hints for researchers initiating new projects. SINGH K, KANT S, SINGH VK, et al. 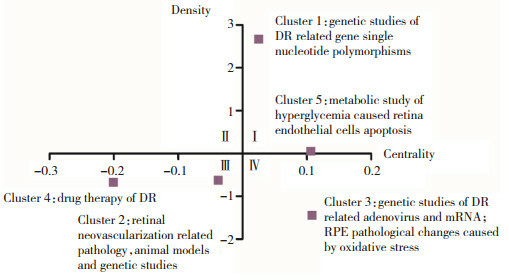 Toll-like receptor 4 polymorphisms and their haplotypes modulate the risk of developing diabetic retinopathy in type 2 diabetes patients[J]. Mol Vis, 2014, 20: 704-713.